The Flower in the Crannied Wall Sculpture was designed by Frank Lloyd Wright and Richard Bock for the Susan Lawrence Dana House in Springfield, IL. Named for the Tennyson poem, Frank Lloyd Wright was so taken by the finished piece that he had one made for Taliesin in Spring Green, Wisconsin. The Alfred Lord Tennyson poem is engraved on the back of sculpture. 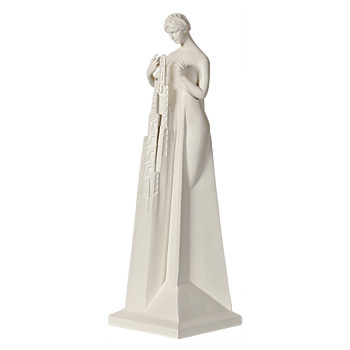 This reproduction is made of hand cast resin and is recommended for Indoor Use Only.